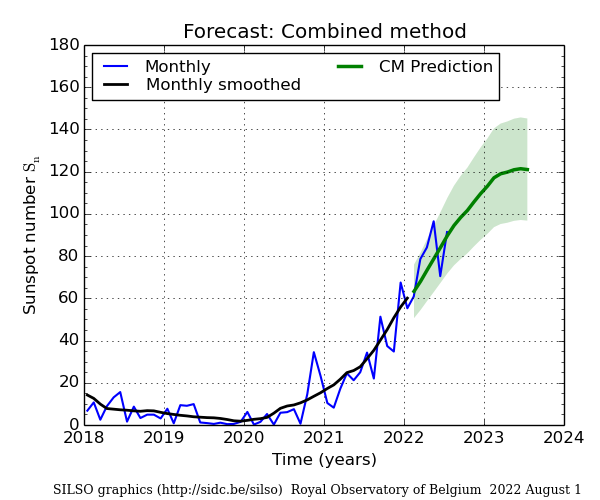 Forecasts of the monthly mean sunspot number using the Combined Method. The base method consists in the least-square fit and interpolation over all past recorded cycles since 1749. The fit is done on the observed 13-month smoothed monthly sunspot number (all available values since either the last minimum or last maximum of the cycle). This is why the prediction actually starts 5 months before the last elapsed month and runs over 18 months (up to 12 months ahead). In order to obtain a reliable prediction around the time of cycle minima (from 1.5 year before to up to the next maximum), the fit uses the aa geomagnetic index as precursor index for predicting the maximum value of the next cycle. The least-square fit then uses a combination of the last observed monthly sunspot number and this aa-based prediction of the next maximum value (until it is actually reached).